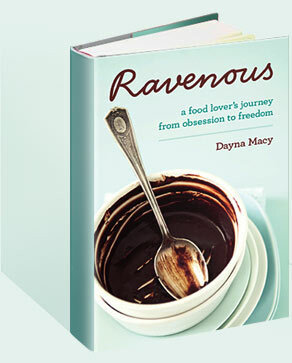 2014 March — Dayna Macy, author of "Ravenous"
Dayna Macy’s Ravenous is an extraordinary book about food. She takes the reader through a journey of the most negative meanings of food to elevate food to it’s most socially conscious, nurturing, and planet caring heights. As she does, she enables one to follow her own healing path and then gives that gift of transcendence to those fortunate enough to read her book. Her writing is absoutely the finest and makes her work of great value on multiple levels. Nice piece by Andy Revkin in the New York Times about my husband, Scott, leaving Grist. Grateful to my friend, Alison Ashton, for re-running this interview with me on the Nourish Network. When I grew up in Rockland County in the 60s, most of the farmland was already gone. As I wrote about in my memoir, Ravenous, There were vestiges of farms but they were farming as entertainment (think scarecrows and pumpkins around Halloween). Which is why I’m amazed and thrilled that there is a renaissance of farming in Rockland County again. Whether it’s the opening of Rockland’s first CSA, or a Farm to Table tour, or spending a day farming at Cropsey Farm, the first new farm to open in Rockland County in many decades. My only knowledge of vegetables came from a can, and I ate mostly processed foods. Today, kids living in Rockland can actually eat fresh chard or leeks or carrots or apples grown right in their backyard. That’s soul food. And it makes me think there really is such a thing as progress.